27 June 2009: Israeli forces arrest 24 solidarity activists and 2 hired Palestinian Israeli drivers in the West Bank village of Saffa. 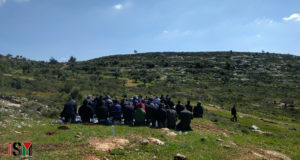 At 7.30am, 35 Israeli and 10 international solidarity activists joined 3 Palestinian families from Beit Ummar to harvest their land. As the group tried to go down to their lands, 50 soldiers and border policemen stopped them. 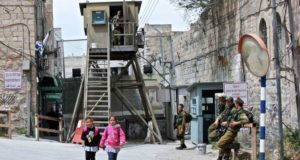 Before reaching the land, Israeli forces arrested 10 Israeli and international activists, under the premise that Saffa was under a Closed Military Zone*. The army was aggressive towards the group and used violence against them. After pushing the group, border policemen arrested another 9 activists. Yousef Abu Maria from the Palestine Solidarity Project, had his leg broken from the use of excessive force. 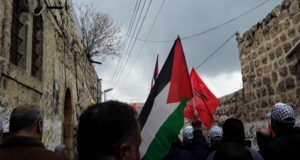 Israeli soldiers tried to arrest him, but the solidarity activists negotiated for the soldiers to release him and allow him to be taken by an ambulance from the Palestinian Red Crescent. He is currently being treated at a Hebron hospital. A female Israeli activist from Tayyoush was also injured and is currently at an Israeli hospital seeking treatment for a potentially broken hand. As 2 cars with hired drivers were leaving the area with other activists, Israeli forces stopped them and arrested 5 more activists and the 2 Palestinian Israeli drivers. The arrested were taken to the Israeli prison in the illegal settlement of Gush Etzion. The activists are members from Palestine Solidarity Project, Tayyoush, Anarchists Against the Wall, and the International Solidarity Movement. They have been accompanying Palestinian farmers to document and deter violence from Israeli forces as the farmers harvest their land. Last Saturday, 8 Israeli activists were arrested as they accompanied Palestinian farmers. *Israeli forces have declared the area in Saffa a Closed Military Zone (CMZ), in direct violation of an Israeli Supreme Court decision. The Israeli Supreme Court determined that Closed Military Zones cannot be issued on Palestinian agricultural land, cutting off Palestinian farmers, or prolonged periods of time. However, Israeli forces have been regularly declaring a Closed Military Zone on farm land in Saffa since 2 April 2009. UPDATE: 1pm, 27 June 2009, All the activists and drivers have been released.